Our BetterZip archive app has just received an update and now it's cooler than before. Not much has changed, it's still one of the best archiving apps on the Mac market, but the update sports a bunch of extra features which will be of use to those who use the app often. Your presets reside in Finder's toolbar, which means you can easily access them after you've selected a couple of files for archiving in your Finder folder. Automation. The new version has Automator actions that allow you to extract or compress files as a part of your regular workflow. 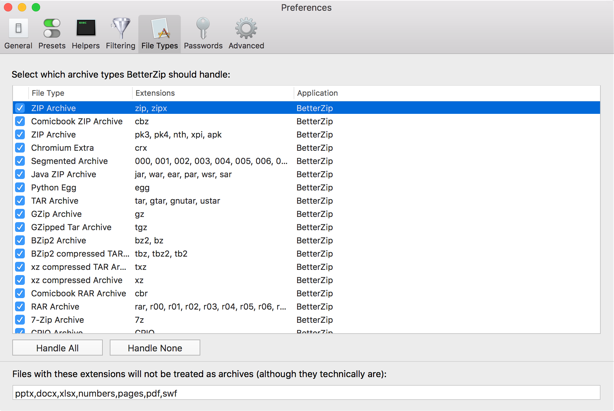 BetterZip interacts smoothly with other apps like Alfred, LaunchBar, and DropZone. You can repair RAR Archives. If you install the external RAR command line tool, BetterZip 4 can try to repair damaged archives when opening or extracting them. That's about it for the new version and all the good news for BetterZip fans out there. We'll keep you posted on the upcoming updates for our apps. Cheers.